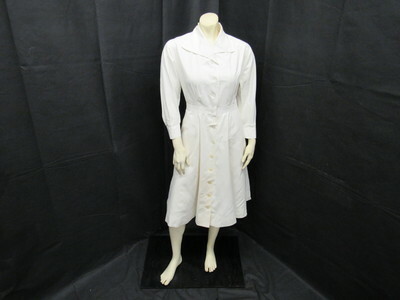 "Uniform: Nurse " Betty Dunman" Dress" by Normadeane Armstrong Ph.D, A.N.P. This is a white dress that presumably belonged to “Betty Dunman" as her name was written on the inside of the collar. The dress is made from a white cotton fabric and goes to about knee length. The Nurse cap found with this uniform can be found by clicking the link below.